Welcome to our blog about ice melt news & tips for snow removal companies. How Many Snow Stakes Do I Need? The short answer is, “You need enough to prevent damage to your plow and your property.” Well, how many stakes is that? Here is a list of all the places it is helpful to out your snow stakes and driveway markers. Items to keep clear of snow such as safety equipment. The common theme of the list are items you do not want damages and items that can damage your plow of vehicle, but let’s be clear on one thing. You can stake anywhere you want as long as you are CONSISTENT, and the stakes help you PREVENT DAMAGE. Stakes are just a communication tool to let people know where things are at that can get hidden under snow, things such as the edge of a driveway. As long as you know what the snow stakes mean and you put enough to prevent damage, you will do alright. Use enough stakes to communicate where dangers can be hidden under the snow. Know your local laws regarding markers used at the end of a driveway. As an example, Minnesota law dictates you put reflectors 12 feet in from the edge of a roadway’s shoulder. Minnesota also recommends you avoid red or yellow reflectors next to the road. Use two stakes next to sensitive items. Put one stake about two feet before the sensitive object and the other about two feet after the sensitive object, so the snowplow operator has a little wiggle room as they work to keep the snow away. Put markers in about a foot from the edge of the pavement giving the snow room to pile up without burying or bending the stakes. Use stakes as “goal posts” where you want the snow to be piled as an easy indicator of a snow pile safe zone without worrying about burying or damaging the stakes. You can just “shoot for the goal” with all the snow. Snow removal companies should use different colors to signify different things. When a person is on a site for the first time, they will have a color indicator as to what the specific hazard is while removing snow. Install stakes before the ground frost layer is thicker than 1/4 inch and before the first chance of a significant snow storm. Some areas of the country may start staking as early as October. If you have ever tried to stake late in the season, you will know it is not fun. Leave stakes in until the trees have pushed out their leaves. Removing stakes too early could mean you get caught without them during a late season snow storm. It is better to use a stake (a fiberglass rod with 360-degree reflective tape) than a marker (a stick with a reflector on it) because a reflector can spin and if the reflector gets sideways, it can become hard to see. Stakes are generally cheaper anyway. Resist the urge of engineering your own stake like a piece of wood with paint on it. If someone has to remove snow for you, they will not recognize it as a safety marker for snow removal. Snow stakes are so inexpensive you are better off just buying the fiberglass rods than creating your own. Get 5/16″ thick fiberglass snow stakes. Thinner snow stakes are more likely to break on you. Thicker stakes will be harder to insert into the ground and will leave more of a noticeable hole in the ground. Make sure your stakes are high enough above the ground to show above the highest likely snow accumulation. You will never see snow get near your total winter snowfall as it compacts and, in most areas, there will be times of thawing, but you DO need them visible through the entire winter! Take note of where you wished you put a snow stake this winter for next year. Whenever you have a new property, especially a large property, you will always find a place you wished you had staked this year. Make a map of where the stakes should go for next year BEFORE you pull them out. Put stakes at radiuses or curves in at least three places. Place the stakes at the beginning, end, and zenith of the curve. You may want more stakes for a large curve. If you have a lot of stakes, get a stake installation tool to create a proper size hole using your feet and body weight to do a majority of the work. In the long run, you will save a lot of time and energy by using a tool to create “pilot holes” for your stakes. For hard surfaces, such as concrete, you can drill or bore a hole and install a stake sleeve that will keep the hole open and ready for the stake from year to year. Buy your snow stakes in bulk from Snow & Ice Salt & Chemicals Unlimited LLC! Yes, we couldn’t resist the urge to put in that plug. We have several colors to choose from, and we can ship them to your door. How Much Salt Do I Need to Spread on a Parking Lot? So, you want to know how much salt you need for a parking lot. We will give you the easy answer just below, but you need to know the correct answer is “it depends.” So, look at the quick, baseline answer, then keep on reading. 2.3 pounds or more per 1000 square feet at 30° pavement temperature for a light snow or icing. Now that you have a baseline, you need to remember that weather conditions and the type of salt you use will change how much salt you need. The colder it is, the more salt you need. Going from 31° to 16° can potentially TRIPPLE your salt usage. The more precipitation you need to cut through, the more salt you need. You need less for a ¼ inch of snow versus a ½ inch of ice. If there is heavy icing, you will need more product. How much more product depends on how much ice there is. If you salt without plowing, you will need more than if you plow and then salt. Pretreating pavement with a brine solution can save you salt over pretreating by spreading rock salt. Prewetting salt can reduce salt usage by as much as 30%. Treating pavement with brine is usually best for pre-treating and for ice. Coarse salt usually cuts through snow compaction best and is often favored by contractors for knocking out snow. All other things being equal, calcium chloride and magnesium chloride will need less salt than straight rock salt. Both magnesium chloride and calcium chloride have more melting power. 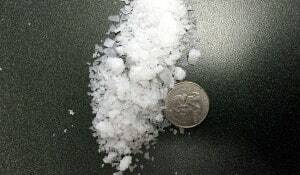 For example, rock salt can only melt ice down to 15°F, but calcium chloride can work in temperatures as cold as -15°F. In the end, you need to use your head. As you get experience, you will get a better feeling for how much salt you need to spread for each situation. A few other points to remember. Your biggest cost waster is overspreading by spreading more material than necessary or by placing material where it is not needed. When you put too much salt down, not only do you waste money, but that salt has to go somewhere so you likely just tossed your money (salt) in the river. Try to avoid overspreading. Some people find it helpful to buy salt that has color so that it is easier to see when you spread it to help minimize over-application. Quality applicators will spread evenly saving you time and salt. Don’t get a cheap spreader just so you can waste money on salt. This rule applies to everything from V-box spreaders to small walk-behind spreaders. Make sure you buy quality equipment. Get your salt or deicing products from a good supplier. 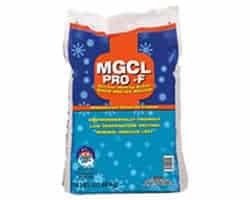 If you buy salt from us, we can give you a great deal on products and we can answer some of your questions about using de-icing chemicals (like calcium chloride) or what to do in specific weather situations. Are Liquid Deicers Environmentally Friendly? Are liquid deicers environmentally friendly? That is a great question and the answer is “yes and no.” That’s a helpful answer, right? So here is the scoop, liquid deicers are friendlier than bulk dry salt in the right application, especially anti-icing applications. Let us break it down for you. You use the same primary chemicals in liquid solutions as you would use in a dry spreader. Since you are using the same materials, you are not using a more environmentally friendly material. Generally, the liquid deicers are a salt-water solution that is 30% salt with the majority of salt coming from plain old rock salt (which is the same as table salt, only in bigger pieces). Two other chemicals (salts) commonly used in liquid deicers and liquid anti-icers are magnesium chloride and calcium chloride. These are generally more environmentally friendly and work in colder temperatures, but are cost prohibitive to use in every case. Liquid Deicers use less Material. Liquid deicers generally use less pounds of salt per square foot of pavement than bulk salt applications. It normally takes 2 pounds of salt in a brine solution where you would need 3 pounds of salt when spread dry. Using less is especially true when we talk about anti-icing applications (when you put material down BEFORE the ice or snow comes). A proper application of anti-ice brine keeps the ice from forming or snow from sticking to the pavement and today’s tools allow for pinpoint accuracy of solution application. With a dry application, you have to put more down to make sure the salt is spread evenly around, and it just takes more dry salt to ensure you have adequate coverage over your entire target area. Liquid Deicers work well for anti-icing or against a thin to moderate ice accumulation on your pavement. You can also use liquid deicers as a pavement pre-treatment before a snow fall. On the other hand, it will not cut through over an inch of snow or through heavy ice very well. In order to get the benefits of both rock and liquid deicers, some equipment will mix the brine solution with the dry salt while the salt is being spread to get the best of both worlds, but if you spread brine where it won’t do the job, you are just wasting the material and wasting material is NOT environmentally friendly. 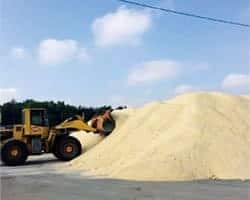 While there is a lot less material used, it is still salt, which is not a problem in small quantities, but in excess quantities, it hurts roads and the environment. There is currently no perfect deicer but using 1/3 less with a brine solution while still keeping people safe is a good start. Using a brine solution is a good idea because not only do we protect the environment, we can also save a significant amount of money by the significant reduction in salt use. Two of the best loved tools to fight winter are Calcium Chloride and Sodium Chloride/Rock Salt. When we compare the two, you will quickly find, there is no “winner.” Instead, it is a matter of using the right tool for the job, and sometimes it is a blend of the two materials that provides the maximum benefit. If you are located in Maryland like we are, or in any of the northern states, you know you have to have something on hand for melting ice and snow BEFORE winter starts. So we wanted to help you get to know the two materials so you can make a wise choice. Sodium Chloride is Cheaper than Calcium Chloride (okay, a LOT cheaper). Rock Salt is relatively easy to find throughout the world and it is easy/inexpensive to extract for use. You can’t get any cheaper than sodium chloride for cutting through ice and snow. Calcium Chloride penetrates ice quicker at lower temperatures. Calcium chloride is able to melt ice at the low low temperature of -20°F, which is lower than any other ice melt products. Rock salt only melts down to 20°F, or a full 40°F difference. Most of the northern states of the US easily dip below 20°F during the winter. There are times when sodium chloride just won’t cut it. Now our super hero Calcium Chloride can melt at temperatures that most of the US will never see. Calcium Chloride is the Nascar of ice melts while Rock Salt is just “Driving Miss Daisy.” Calcium Chloride works fast to pull water in and change the melting point of the water, and so when speed is necessary, Calcium Chloride is hands down your best option. Sometimes it feels like you need to dump 5 lbs of rock salt on a small patch of ice just to see it melt. Calcium Chloride can melt the water in lower concentrations meaning you will have to spread a lot less on to get rid of that same patch of ice. Calcium Chloride is Friendlier to the Environment. Not only do you use less of it, but Calcium Chloride does not negatively impact plant life as drastically as Sodium Chloride. Sodium Chloride is one of the most caustic ice melts out there not only on plants, but on concrete as well. Did We Mention Sodium Chloride is Cheap? Holy Guacamole, rock salt is cheap. When the temperature is 20°F or higher, our pocket books say you ought spread only rock salt. It is cheap, cheap, cheap. This is the reason why rock salt is the primary ice fighting product at homes and on highways, it is the most cost effective way to prevent accidents and injuries during winter events when temperatures stay above 20°F. What About Both Calcium Chloride and Sodium Chloride Combined Together? We are glad you asked. Yes, blending both together gives you some of the benefits of both! Our ComboTherm(Calcium Chloride mixed with Sodium Chloride) is way less expensive than Calcium Chloride on its own, yet it melts in much colder temperatures than rock salt by itself. Generally, we would recommend getting the ComboTherm blend, because it is not much more expensive than rock salt, but it is going to melt at those lower temperatures. If you are very concerned about the environment, first, make sure you are ONLY spreading enough ice melt product to melt the ice (over-salting is generally a bigger problem than which product you choose). Beyond that, choosing Calcium Chloride will be friendlier than rock salt, but definitely review our article on which is the most environmentally friendly ice melt product so you can make the right choice. If you want the best ice melting product out there, definitely choose calcium chloride, you can’t do better. And if you just want cheap, yup, sodium chloride (rock salt) is for you my friend. Did We Mention We Sell Ice Melt Products? We buy and sell in bulk and we try to offer you the best prices in the area. If you are in Maryland, the DC area, or would like a shipment, feel free to give us a call! We once viewed dust as just an annoyance, but now we know that constantly kicking up dust is bad for people, machines, and the environment. It wasn’t that long-ago we gave dust little attention, and now, larger construction companies are requiring their people to wear breathing protection where there isn’t dust control because we are beginning to realize constantly introducing people to large amounts of air born particulates creates negative long-term health consequences. Dust control helps people (and machines) breathe easier preventing problems further down the road. So, what are effective methods of keeping dust down? 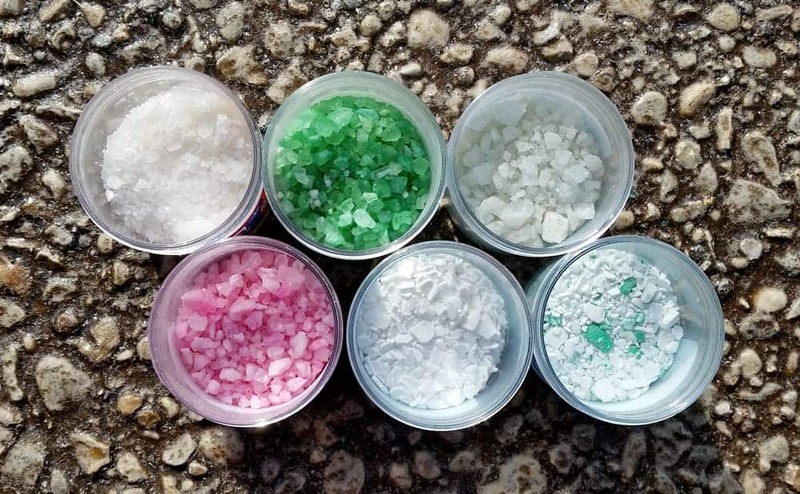 The primary way is to use environmentally friendly “hygroscopic” salts. Hygroscopic is just a fancy word meaning the material attracts moisture from the air and its surroundings. If you have ever left table salt out on a humid day and then you notice the salt wants to clump together, you have already experienced hygroscopic salts in action. With environmental dust, hygroscopic salts help the loose dirt essentially stays moister with the hygroscopic salts pulling moisture into the dirt and therefore dirt stays on the ground better when the wind is blowing. After a while, the hygroscopic salts will help the dirt bind together and become compact. As the salts seep down, they actually create a stabilizing effect which is great for roads because you see lower maintenance costs and less damage from frost and ice. What Should I use for Dust Control? 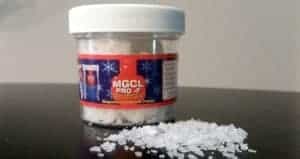 The two most popular, environmentally friendly salts are Magnesium Chloride and Calcium Chloride. You can apply them as a brine solution (salt water) or spread them as flakes. Brine solution is usually the method of choice for road crews and large construction sites because it is quick and easy, but you need a brine sprayer. A brine sprayer is nothing more than a big tank on a big truck to hold the brine solution plus sprayers on the back to deliver the product onto the ground. Usually the brine is 33-35% salt but be sure to read the directions of the specific product you will use. For smaller areas or for those who do not want to buy expensive equipment, we like to recommend getting Magnesium Chloride Flakes. Flakes are great because the surface area helps it stick to the ground and it won’t roll like pellets do. To apply flakes, you want to spray down the area with water until it is damp, then spread about 2 lbs of magnesium chloride per square yard immediately afterward while the ground is still damp. Once the ground dries, add another pound of magnesium chloride per square yard. That means one 50 lb. bag of magnesium chloride flakes should treat about 150 sq. ft. the first time around. After that, you can usually apply one pound per square yard as necessary which will be more often in an open area that gets more rain and less often in something like an enclosed horse arena. With something like a horse arena, you may need to apply more to entryways and less in the center of the arena. What will my Dust Control do to my Plants? Treat Magnesium Chloride and Calcium Chloride like fertilizer around your plants. Magnesium Chloride and Calcium Chloride are non-toxic and will not hurt plants if you get a little near your plants, but too much of anything will kill your plants. Too much water, too much fertilizer, or too much magnesium or calcium chloride will hurt your plants if you go overboard, but if you get a little on the ground near your plants, it will have no negative affects unless you are dealing with a super sensitive species. Do You Need Dust Control Hygroscopic Salts? If you need Magnesium Chloride or Calcium Chloride, we are happy to help you out. 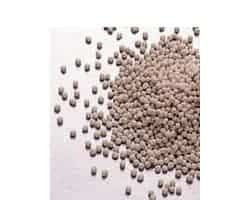 Just give us a call and we can tell you how much money you will save when you buy in bulk from us. What is the Most Environmentally Friendly Deicer? There are a lot of blog posts out there that tell you they have the “silver bullet” deicer that will melt snow and ice at low temperatures while at the same time be healthy for the environment. Sorry to tell you, there are no perfect deicers. Every single type of deicer currently on the market in large enough quantities will negatively impact the environment in one way or another. Beyond the environmental impact, they all have the potential to corrode our roads (more so with the chloride-based products and not so much with the carbohydrate deicers) and they also don’t all work the same in very cold temperatures (sorry, but nothing beats out Calcium Chloride for breaking up ice in frigid weather). There are three basic types of deicers out there, and each type has their own strengths and weaknesses. The three categories we will cover are chloride-based deicers, acetate-based deicers, and carbohydrate-based deicers. Before we cover those, we should stress that the best way to protect the environment is to not over-salt. By reducing the amount of salt, you reduce how much of the deicer gets into our soil and into our waterways. You want to put down just enough deicer (or preventative anti-icing agent) to keep people safe without an ounce more. Chloride based deicers are the most common deicers used in the United States and throughout the world with rock salt leading the way. Rock salt is the same thing as table salt, only in larger grains. 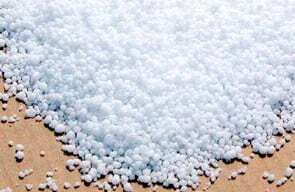 Calcium chloride and magnesium chloride are also popular chloride-based deicers. All chloride-based products are highly corrosive to metals and moderately corrosive to concrete. More importantly, chloride-based deicers are harmful to plants, moderately harmful to soil and waterways, yet they at least have little impact on air quality. In other words, if you put enough salt on your plants, they are going to die. A little salt in the river won’t hurt anything, but after years of use, salinity starts adding up which can be toxic for aquatic life. 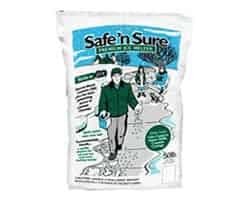 We can say that calcium chloride and magnesium chloride appear to be less harmful to the environment because they can help soil in lower doses by improving soil structure plus you need less of these two than rock salt to break-up ice. So we can say they are more “environmentally friendly” than other deicers to your soil and they introduce less chlorine into the environment because it takes less volume of either of these two deicers to do the same work as others, allowing you to use less deicing product overall. Generally, most people do not spread calcium chloride or magnesium chloride by themselves because of the cost as compared to rock salt. Instead, most people will use them in blends with rock salt allowing for maximum impact while keeping costs reasonable. 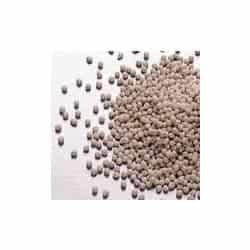 Acetate-based deicers do not poison the ground and waterways with chlorine and in small amounts they can act as fertilizer. 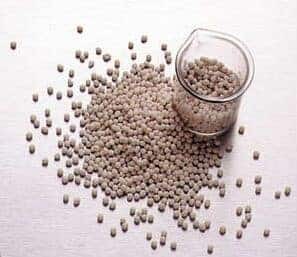 The key point is “small amounts.” Deicers like Calcium Magnesium Acetate (one of our favorites), Potassium Acetate, and Sodium Acetate are moderately corrosive, don’t hurt soil or the air in moderation, but in larger quantities they can be devastating to plants and aquatic life. What happens is they create osmotic stress (water is pulled out of the cells) when found in larger concentrations in plants and they set off microscopic organism growth which steals oxygen and other resources from affected plant and aquatic life. This second issue is a similar to what happens when too much farm runoff gets into streams where you see a lot of algae growth, yet the fish may be oxygen starved. Carbohydrate-based deicers are friendlier to metals and concrete but they do not have a whole lot of power to melt ice in cold temperatures. Carbohydrate-based deicers are made from beets or other fruits or vegetables and can be pricey for how little work they actually do to remove ice. Because these deicers have not yet shown a lot of value in cost versus the benefit, most people just avoid them altogether (which is also why we do not stock them). You are more likely to see these types of deicers as part of a blend then by themselves if you see them in the stores. Carbohydrate-based deicers have a similar effect upon plants and aquatic life as acetate-based deicers. The sugars are going to spur the growth of micro-organisms which steal necessary resource for growth from plant and aquatic life. If you have every mixed in compost into your soil without having let the compost “cook thoroughly” or break down all the way, you may have seen plants you put in that soil struggle or even die. These carbohydrate deicers can have the same effect in larger concentrations. While bacteria break down the deicer, they use up nitrogen and oxygen, and if there is too much carb-based deicer in an area, plant or aquatic life can be killed. There is no one right answer since there are pros and cons to every product. Again, the first step in protecting our environment is generally to just use less deicer. Apply only as much deicer as is necessary for safety. If you can, one option is to prevent traffic from certain areas, so you don’t have to apply deicer in those spots at all. Another option is to use deicer that has a bright color to it, so you will be able to accurately see how much salt you have actually spread. In the end, the deicer for you will be what fits your personal choice and yet still removes the ice. One of our personal favorites is Calcium Magnesium Acetate for when temperatures are above 15 degrees. 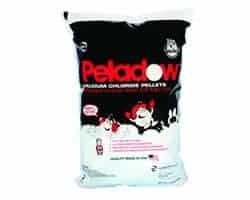 It is one of the friendliest deicing products available that is commonly found in the market. When you have colder weather, then Calcium Chloride or a Calcium Chloride blend like Hot Melt are your best options because they can work in very cold temperatures yet it takes a lot less to get the job done (like 2-7 times less depending on the product you are comparing it to). Commercial Ice Melt is essential for any serious contractor. You know that rock salt is great, but it just does not do the trick in all situations. Like when you get an ice storm followed by really cold temperatures, you need something that can cut through the ice today, not when the weather warms back up. This is where a large arsenal of commercial ice melts come in really handy. Some of the best ice-melts are considered “hot melt.” The difference with hot melt is that it is exothermic, rather than needing heat to melt ice, it creates its own energy. This means that the hot melt works at much lower temperatures and can be really effective against ice. Rock salt is not going away any time soon. The inexpensive cost to get rock-salt in bulk makes rock salt the primary weapon of choice for melting ice and helping tackle snow. When the temperatures get really cold, most ice melts use a blend that is about 80% rock salt and 20% something else like magnesium chloride. The blend helps keep the cost down while the magnesium chloride starts the melting process and the rock salt finishes off the job. If you are a contractor, you likely already knew all that. The problem becomes, where do you get commercial quantities of ice melt? Should you pay way too much at a big box store? Should you get it from a chemical supply company that primary sells cleaning agents and knows little about which ice melt to use when? How would you like to buy your commercial ice melt from guys who started a company dedicated to commercial ice melt, guys that have experience pushing snow themselves? At Snow and Ice Salt and Chemicals, Unlimited, you get the price you need and support from people who have experience doing your job. We always keep plenty of inventory in stock and during winter weather events, we keep the doors open and the lights on so you can keep serving your customers. We have several locations in Maryland and we ship to your location as well. So if you need commercial ice melt or any other snow and ice removal products, give us a call or stop by today. We would be happy to serve your needs.